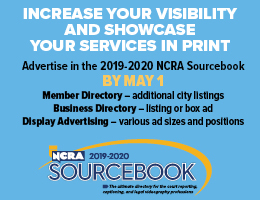 The NCRA Technology Committee is taking your questions on topics surrounding realtime and technology. 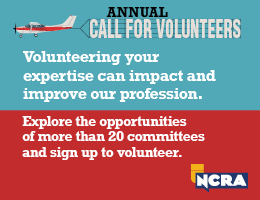 Send the questions you want the Technology Committee members to tackle to jcrfeedback@ncra.org. Videotaped depositions are being scheduled more frequently for me lately. I’m one of those reporters who likes to listen to the videographer’s audio when proofing my transcripts — it’s so much clearer because of the witnesses and attorneys being mic’d up! I’d like to know how I can easily listen to the videographer’s audio with my foot pedal. I know I can convert the .mp3 file to a .wav file and then associate the audio with my transcript; but I want a simple and easy way to just listen to the .mp3 file. Help! It’s great to hear that you are getting more work! Congrats! Here are a few ideas on what to look for when you are considering a foot pedal. Lynette Mueller, FAPR, RDR, CRR, a freelancer based in Memphis, Tenn., and Chair of NCRA’s Technology Committee, offered the following. It is the obligation of a professional court reporter to stop the proceedings when the speed of testimony presents an issue, if you didn’t hear a word, or when speakers are talking at the same time. One must never rely on the audio backup to create an official record. Readbacks occur often during the proceedings, and you don’t want to play back the audio for your client when a readback is requested. If audio backup is requested by a client, check with your specific state rules in regard to your obligation to do so. If you do, however, provide a copy of the BAM, be sure to offer the same service to opposing counsel. 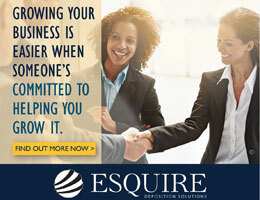 Ensure that no off-the-record discussions are included in the recording. NCRA has additional guidelines to help court reporters regarding best practices related to audio recordings. Look on the NCRA website for Section IV: Backup Audio Media in the COPE – Guidelines for Professional Practice. There are several options for good foot pedals for court reporters to aid in transcript production for playback of audio. I have used the vPedal for several years and love it! It works with my CAT software for those times I need it and it works seamlessly in conjunction with AudioSync. Look to your CAT software vendor if help is needed to set up the foot pedal for use during edit. Amazon is every court reporter’s friend and you can purchase the vPedal on Amazon. For videotaped depositions, it’s always great when the videographer provides the audio backup. It’s a great resource for us, for sure! The witness and attorneys are mic’d up, and the audio is clear and crisp. Most of the CAT software requires a .wav file as the backup media. While there are plenty of options to convert the .mp3 from the videographer to a .wav file, sometimes there are occasions where it’s faster and easier to just upload the file to Windows Media Player and you’re good to go! Another added benefit of using the foot pedal is that it saves time because of not having to take your hands off the keyboard during edit. WMP is included in clean installs of Windows 10 as well as upgrades to Windows 10 from Windows 8.1 or Windows 7. Foot pedal of choice. Mine is vPedal, as mentioned above. 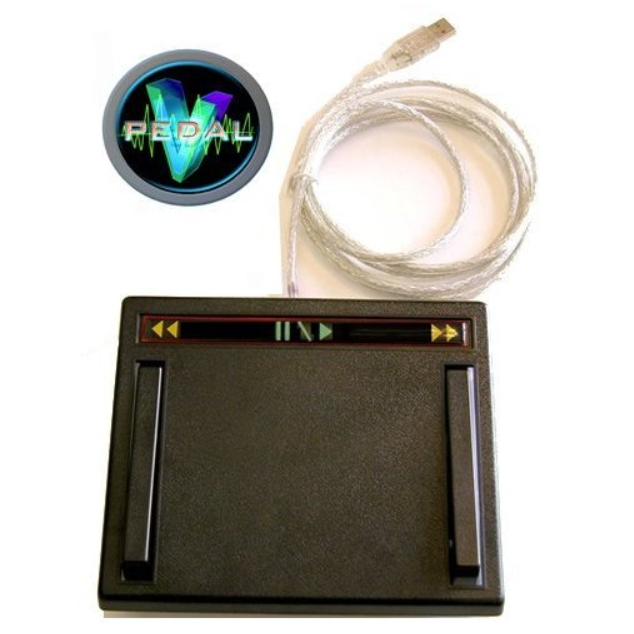 Connect the foot pedal following the instructions on your installation CD or from the Hot Keys application downloaded from the website. The installation CD will configure the foot pedal to the computer and install a control application from which you may set up shortcuts and commands. Again, if you wish to use the foot pedal within your CAT software, check with your vendor for assistance, if needed. I pinned my Hot Keys application to my taskbar for easy access! 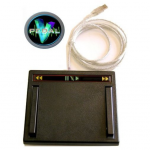 Install the vPedal WMP plug-in from their website. This plug-in has been tested on Windows XP thru to Windows 10. Here is a detailed list of steps to take once your plug-in has been installed. Know the location of your audio file you wish to utilize. Locate the videographer’s audio, select it, then highlight the file to drag it into the WMP application. Next, open up your vPedal Hot Keys application. My settings on the application: Back seconds step: 5; Forward seconds step: 5; Release seconds step: 2; Tap Enabled. Highlight the file you wish to listen to and double-click. The file will start to play. I strike the middle of the foot pedal to stop playback of the file. I strike the middle of the foot pedal to resume the audio. Tip: If you have your audio file associated with your text file, you may want to consider using a text-only file when using the videographer’s audio within WMP. You could get two audio files playing at the same time when using the foot pedal. WMP supports many different file types. Learn more about Windows Media Player, troubleshooting problems, and how to customize Windows Media Player with easily installed skins, visualizations, and plug-ins for a new look and extra features. Myrina Kleinschmidt, RMR, CRR, CRC, a freelancer and agency owner based in Wayzata, Minn., and a member of the Technology Committee, shared the following suggestions. We’ve used GearPlayer by TranscriptionGear for three years. The transcription software we were using before GearPlayer did not allow us to play back audio and view video files — only audio. We specifically switched to this software so that we could have the option of listening to audio alone or listen to audio and view the video — all accomplished with the ease of foot pedal control. With some witnesses it helps to be able to see their mouth while preparing a transcript (slurred speech, mumblers, low talkers, accents). Sometimes I like to verify if the witness nodded or indicated, so the video is also nice for that. If the videographer can give you the full video file(s) versus just the audio, then you have the full advantages of having mic’d audio and video viewing when needed in preparing the transcript. This link is all you need to know about the GearPlayer software. It’s $119 for each computer; so if you want it on two computers, you will need two licenses. You can download a full-feature free trial and test it for five days. 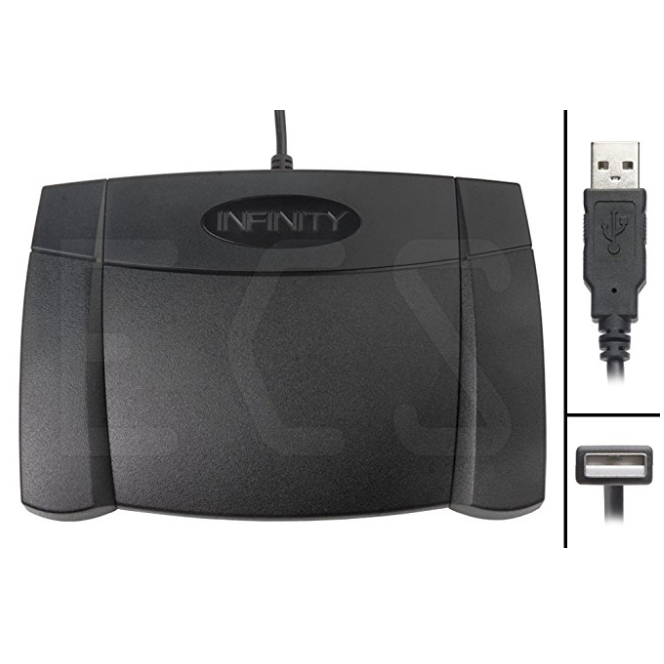 I purchased the USB foot pedal from them ($49 at the time – IN-USB-2 Foot Pedal by Infinity). 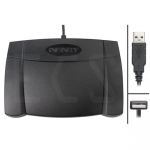 With this program you have the option of using a foot pedal or the keyboard and mouse, so you could try out the trial program without a foot pedal to see if you like it before purchasing. It’s simple to use. I drag and drop the file into the work space. It figures out the format and will play it back. Some of the audio format files I’ve played on this recently are .mp3, .m4a, and a .wav file. For video format files, I recently have played back an .mp4 and .mov — all drag, drop, and play. The program has a built-in converter so if it doesn’t recognize the format, it will give you an option of trying to convert the file to something it can play. You can play back from the videographer’s video CD or DVD as well, no converting needed. A nice feature is you get audio feedback when rewinding and fast forwarding, sounding similar to the old tape dictation machines. Sometimes when I need to play a file and am not at a computer that has GearPlayer, I realize how much I like the feedback feature. It makes it easier for me to know when to stop rewinding. Sound quality can be adjusted for soft voices and noise reduction, as well as playback speed. There are other features which I have not used that are all explained in this GearPlayer link. Sandra Mierop, FAPR, RPR, CRR, CRC, a freelancer and agency owner based in Anchorage, Alaska, uses Express Scribe and offers the following. 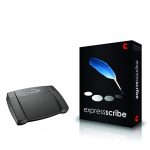 I’ve used Express Scribe Pro for many years. A free version is available, but after I used it a couple of times, I made the purchase on Amazon. The Pro version accepts virtually any audio format, including videos. Express Scribe has many features that help you work faster, including shortcuts for starting/stopping the audio, rewinding, forwarding, playing fast speed, and playing slow speed. I like the “auto backstep on stop” feature when scoping a video, allowing you to automatically rewind a word or two from where you left off. I up the speed to about 150 percent when proofreading with the foot pedal, and the audio is still surprisingly clear. Express Scribe is very easy to use. Once you have it installed, it is just a matter of dragging and dropping an audio file into it, and you can begin listening immediately. A challenge with Express Scribe is that some of its shortcuts interfere with my CAT shortcuts, and those shortcuts cannot be changed in Express Scribe. Tip: Save your codes when you purchase Express Scribe so that you don’t have to purchase it again when you change computers.